The 2010 World Series headed for the Lone Star state for Game 3. This was my first trip back to Texas to cover baseball since the Chicago White Sox swept the Houston Astros to win the 2005 World Series. Ah, sweet memories! 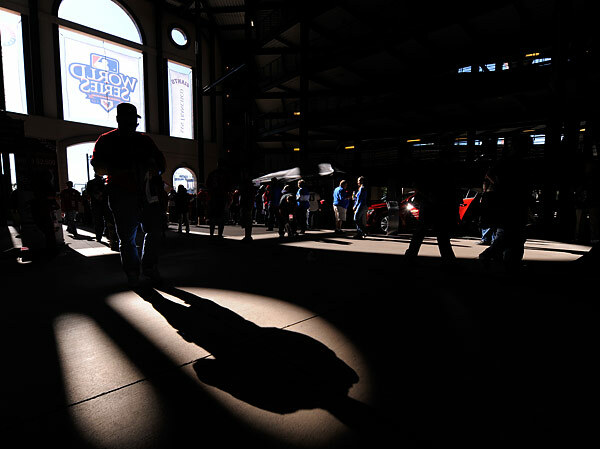 This time, the venue was different as the action shifted to Rangers Ballpark in Arlington. After enduring more cold, wet, windy World Series evenings than I care to remember, heading to a World Series game without being layered up was a welcome treat. 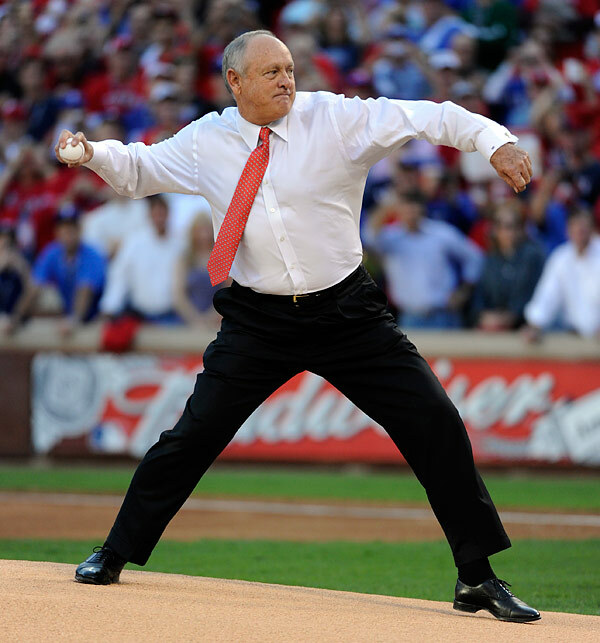 Throwing out the ceremonial first pitch for Game 3 was current president and Rangers legend Nolan Ryan. Watching the “Ryan Express” throw again brought back fond memories of photographing Nolan throughout his career with the Astros and Rangers. 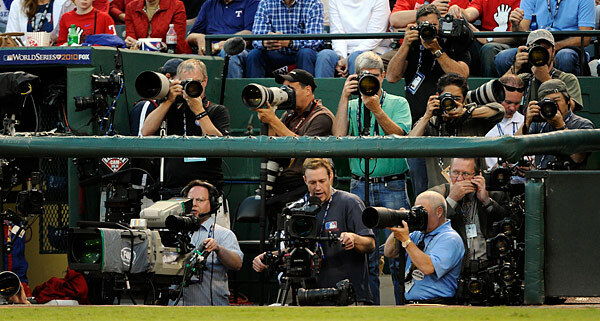 The photo accommodations at Rangers Ballpark were less than ideal, especially when compared to the great positions we had at AT&T Park in San Francisco. 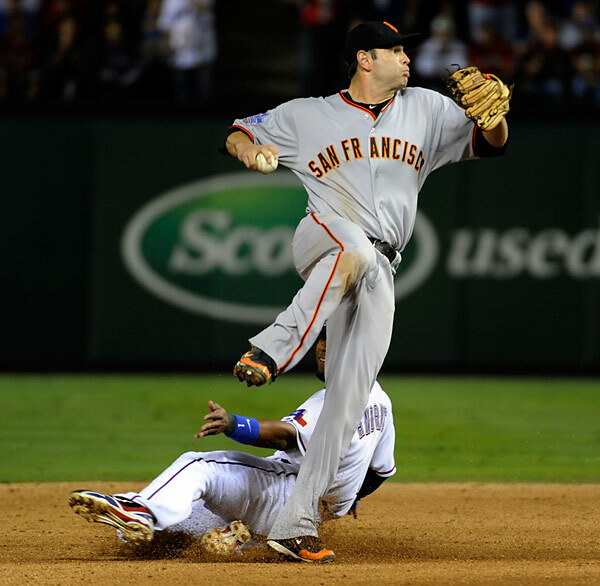 MLB Photos teammate Brad Mangin experienced a lousy night after being assigned to the up spot for Game 3 and has detailed his night of horrors on his blog. I had to contend with being blocked by Giants players or staff standing on the dugout steps while shooting from the third base photo pit. A challenging night, to say the least. Game wise, I got my wish as the Rangers won their first World Series game, defeating the Giants 4-2. Photo wise, it wasn’t much of a night for me. 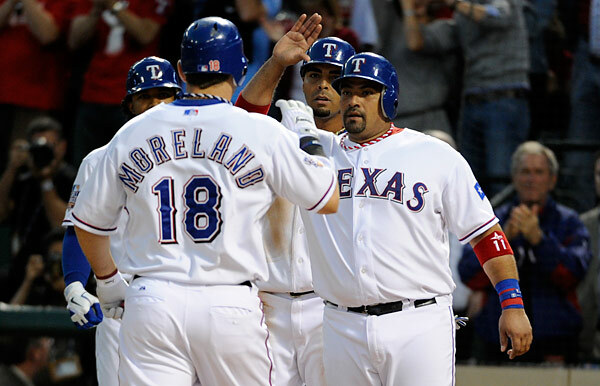 Mitch Moreland had the big blow for the Rangers, hitting a three-run home run off of Jonathan Sanchez in the 2nd inning. 3 innings later, Josh Hamilton connected for a solo home run off of Sanchez to finish the Rangers scoring for the night. 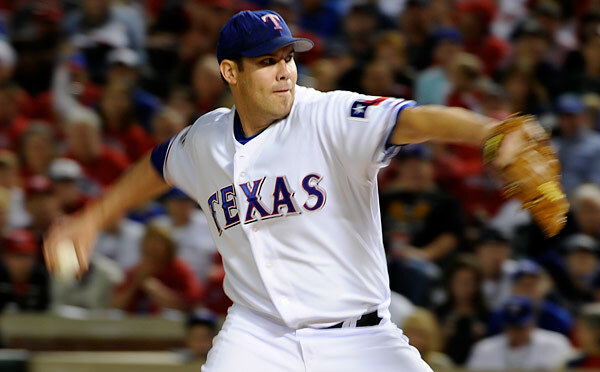 Colby Lewis threw 7 2/3 strong innings and Neftali Feliz pitched a one-two-three ninth to earn the save as the Rangers won the first World Series ever by a Texas team, guaranteeing that there will be at least a Game 5 to look forward to. I’m hoping the Rangers continue their winning ways so that we can all go back to San Francisco to finish off the 2010 baseball season. I’m a big fan of a Game 7 winner take showdown. I love the drama and tension that a Game 7 provides. Time to head to the ballpark. More to come! This entry was posted on Sunday, October 31st, 2010 at 1:50 PM	and is filed under Assignments. You can follow any responses to this entry through the RSS 2.0 feed.